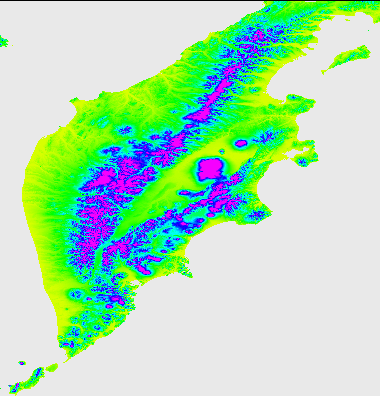 I have assembled a DEM of Kamchatka from SRTM data. I combined version3 DEMs from CGIAR with JPL data north of 60 degrees. Void-filling and sea masking were done with my algorithm and a world shoreline north of 60 degrees, and with CGIAR algorithms south of 60 degrees. The DEM covers an area from 155E, 50N to 165E, 60.37N. These are the corners of the grid; the coordinates of the cell centers are half a cell (1.5") in from the corner. Data is exported in ESRI's "gridascii" format. Six header lines are followed by rows of elevations, north to south. 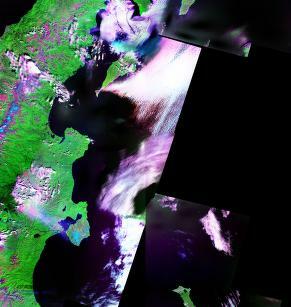 Kamchatka peninsula from the SRTM DEM.